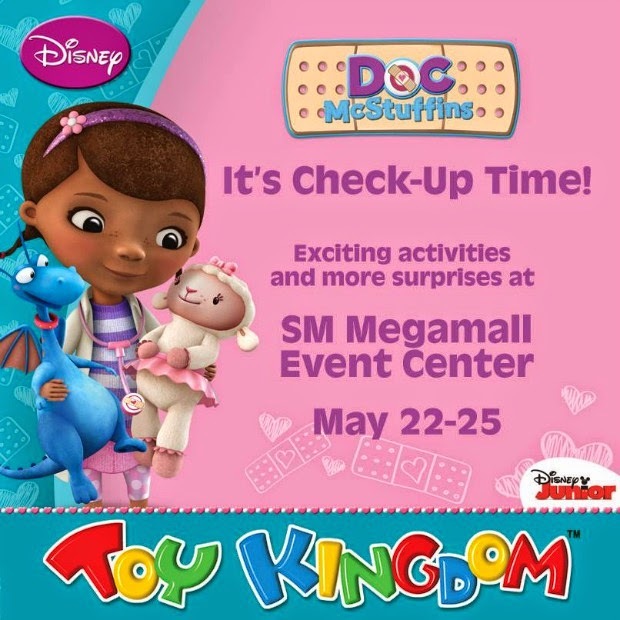 Hey Doc Mcstuffins fans out there, there's an event at SM Megamall for your little doctors! I was super excited when I saw this poster on Toy Kingdom's Instagram yesterday. Read more after the jump! My little girl is a huge Doc Mcstuffins fan. She brings her doctor's bag everywhere and gives "chichaps" (check-ups) to everyone. At two, she can say stethoscope and otoscope properly, and knows what these are for. So funny! 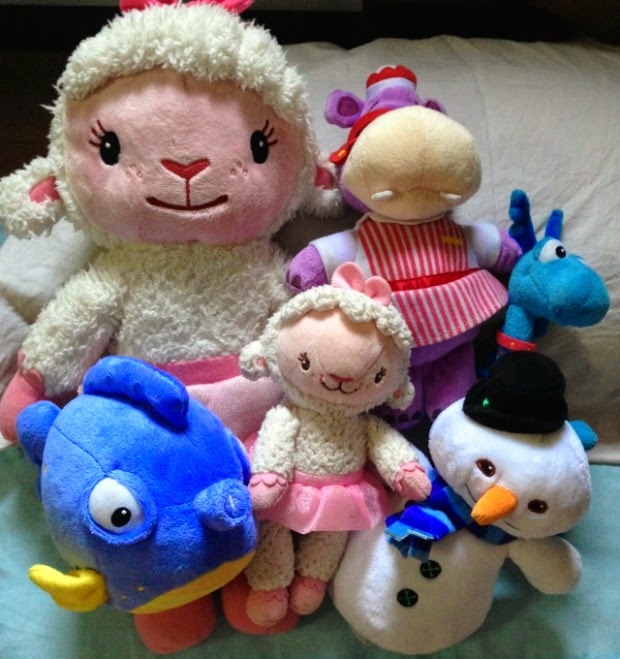 Her Tita Norren bought her the complete gang for Christmas. She loves these dearly. 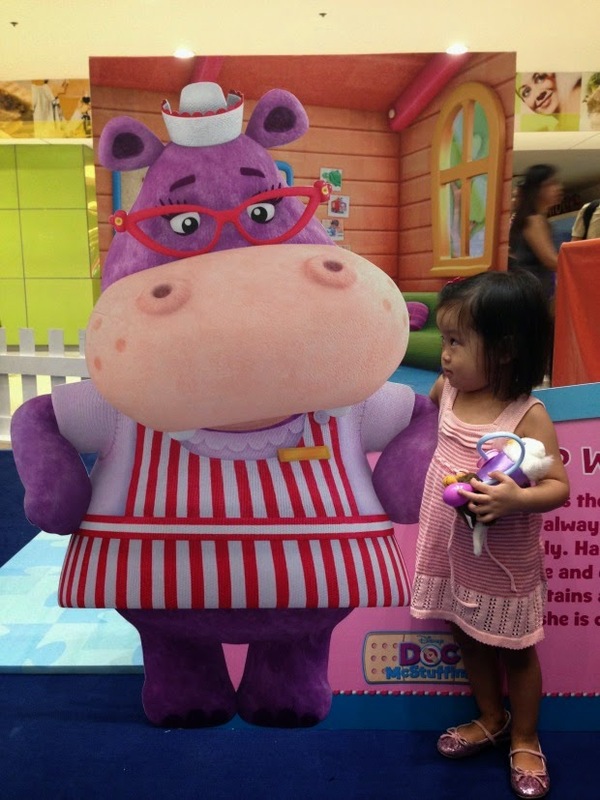 Her Ninang Kristine bought her a Doc Mcstuffins mic after seeing a funny video of her singing the show's Checkup song. We can't wait to receive it! 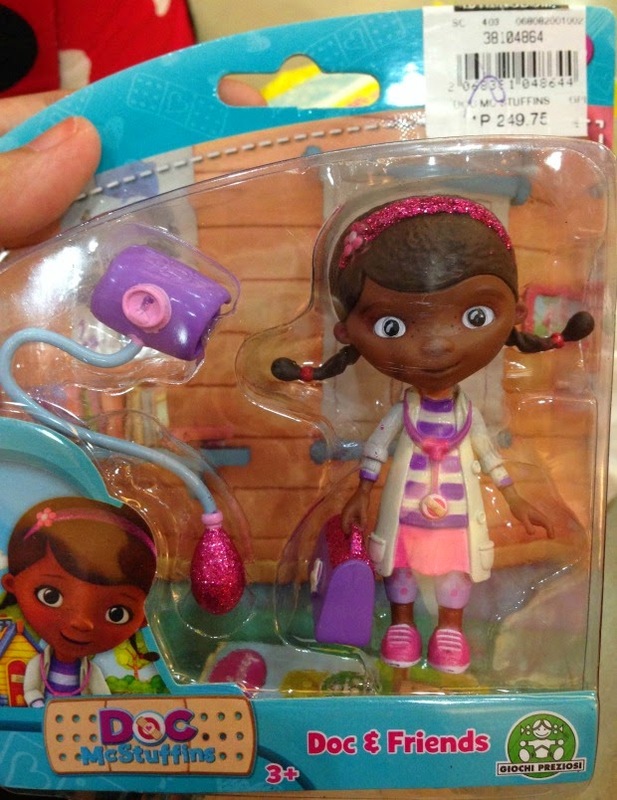 The only thing missing is a Doc Mcstuffins doll, because we figured, she could pretend to be Doc. 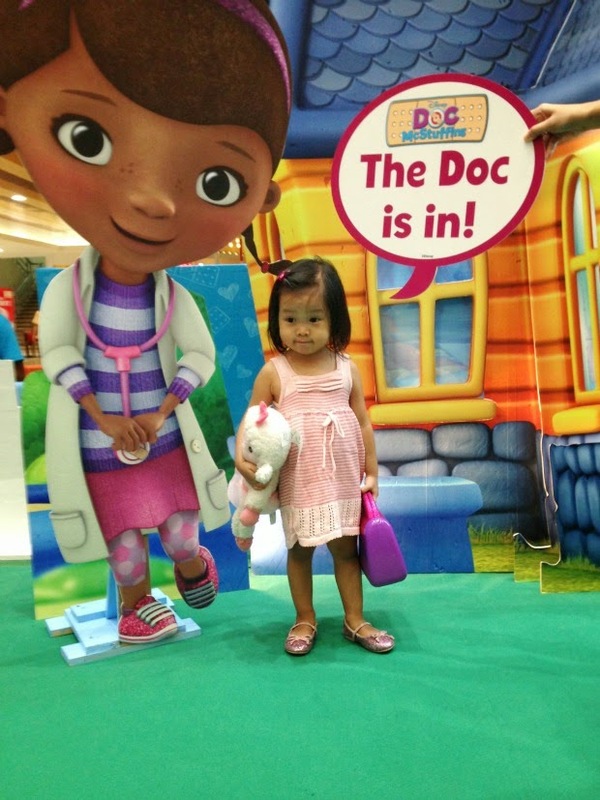 Okay, so back to the Doc Mcstuffins event at SM Megamall. We went there around lunch time today, and thankfully, there was no one else there yet, so no lines! The little girl made a beeline for the entrance, and I had to stop her and tell her we needed a "ticket" to enter. The ticket being a Php 500 receipt. 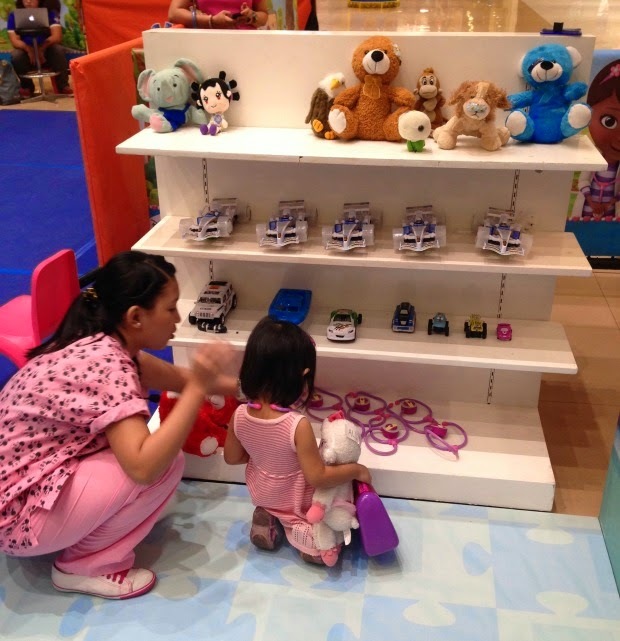 For a minimum single receipt purchase of Php500 of any Doc Mcstuffins or Disney merchandise from Toy Kingdom, your little one gets to enter the activity center at Mega A, and have fun participating at the different stations. There are merchandise displayed right outside the entrance. (The event area is in front of Toy Kingdom and the Food Court, by the way). Everything's on sale at 10% off! So what can you buy to get access to the event? The plushies in the photo above are available there. They're very pricey here though, so we are so happy we received them as gifts last Christmas! Or else, butas na naman ang bulsa! Haha. What I got her were the mini figures that go for Php 249.50 per set. A set includes a mini figure with a little doctor's tool. Perfect size, because they'll fit in our dollhouse! She's going to have so much fun with these. I'll probably blog a review after. Now armed with the required receipt, we were ushered to the registration counter. They prepared a name tag for the little girl and gave her a Big Book of Booboos (which was actually just a tiny booklet with blank pages inside). 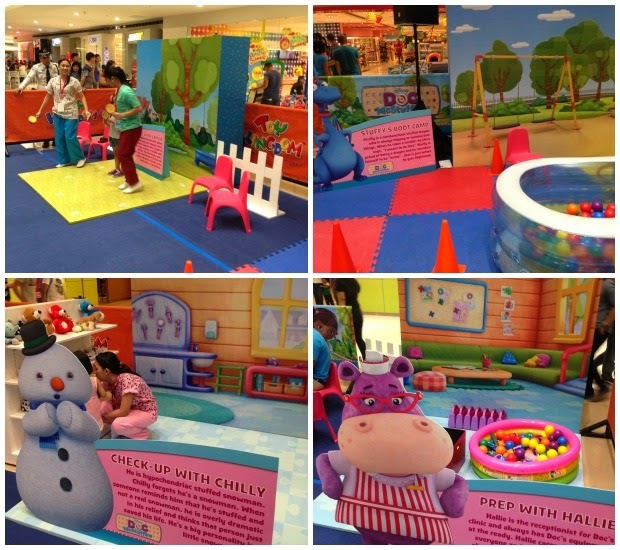 Inside, there are four activity stations, plus tables where kids can write in their Book of Booboos. At first, all Little Moon wanted to do was take a photo with the characters, and didn't want to do the activities. The staff manning the event didn't push her to participate, which was great. 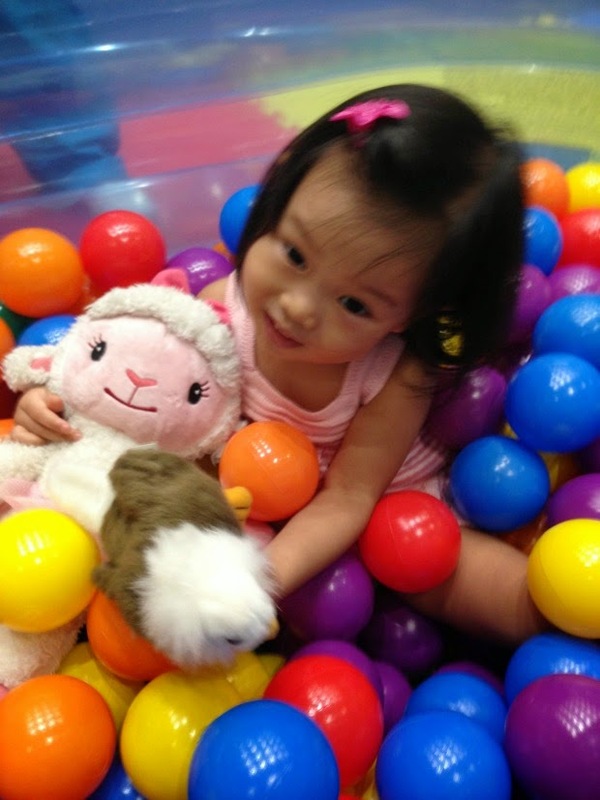 She skipped the dance activity at Lambie's station, and didn't even want to jump in the ball pit at Stuffy's station. Good thing she had a great time taking photos on stage, where Doc's clinic was set up. 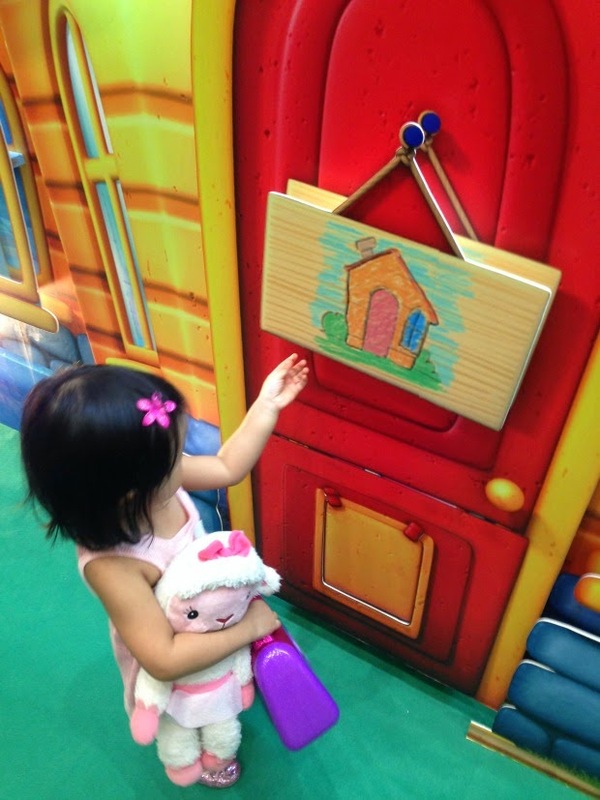 It's not a real play house, and the little girl said "We can't go inside, no?". Hahaha. But the house looks really great in photos. It almost looks 3D, very nice backdrop! It was at Hallie's station where Little Moon had the most fun, because there were a dozen pressure cuffs hidden in ball pits. 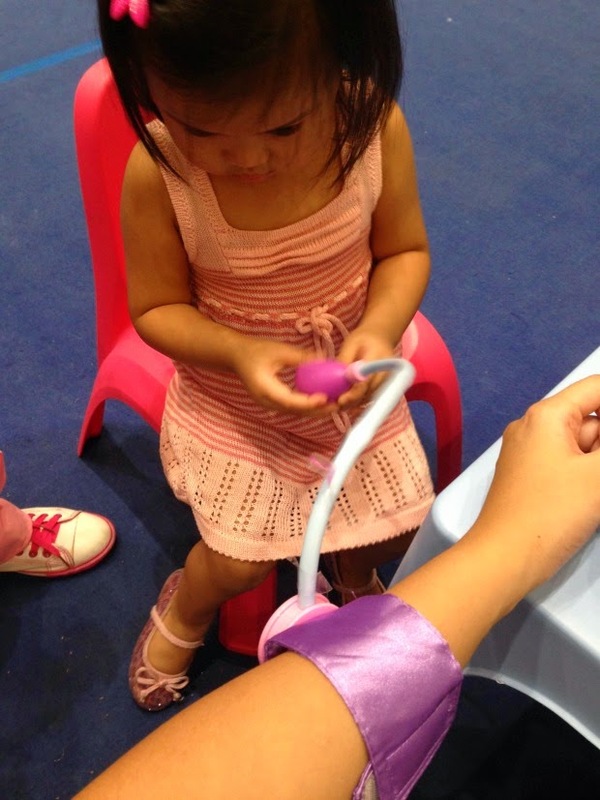 We don't have a Doc Mcstuffins pressure cuff (or pump?) at home, because her doctor's bag came with a little Lambie and a leg cast, and not the same set sold at Toy Kingdom. So it was so funny seeing her try the pressure cuff. She does an impressive imitation of the sound by the way, which she probably learned at the hospital when her Lola Mama was confined months ago. She goes "Shhh, huh, shhh, huh, shhh, huh". Super funny, you should hear it! After that station, she was game to try the ball pit, and even went up the stage again to have more pics taken. We had so much fun. I think it was a good idea to visit today, because we could take all the pics we wanted while the place was deserted. 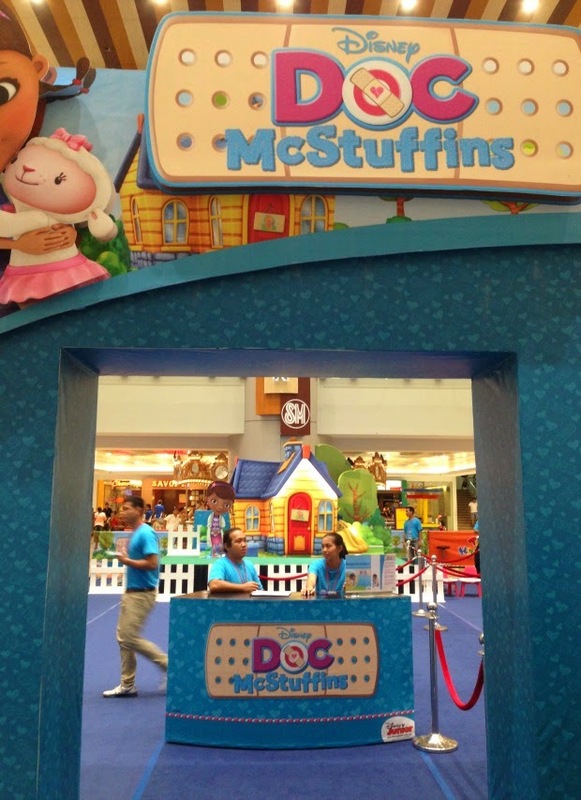 You still have the whole weekend to enjoy the Doc Mcstuffins event at SM Megamall! The event runs from 10am until 10pm, May 22 - 25. Go bring your kiddos! Only one adult per kid by the way. And only one access per receipt, so if you have two or more kids, better split the purchase so you get separate receipts! Have fun! 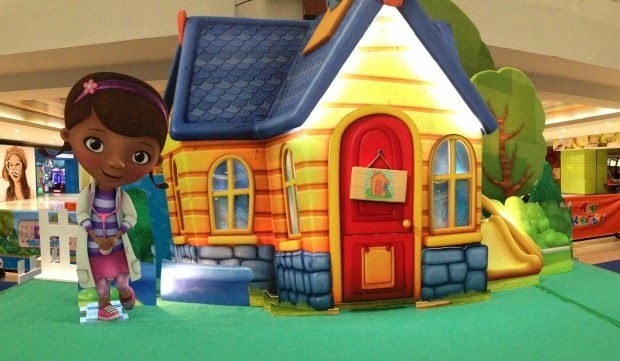 Doc Mcstuffins is a Disney series on Disney Junior, and airs everyday at 9am. We don't have Disney Junior though, so we bought some episodes through iTunes last year and we've been watching them on regularly on the iPad ever since. Your sweet thoughts are always welcome!